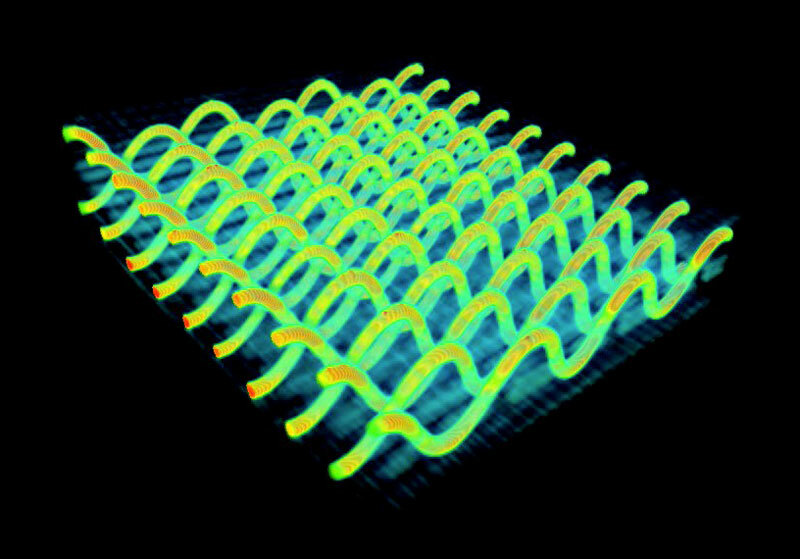 X-ray computed microtomography showing sinusoidal microchannels (300 μm diameter) in an epoxy composite. VascTech (Vaporization of sacrificial components Technology) is a unique process developed at the University of Illinois at Urbana-Champaign (UIUC) to imbue composites with three-dimensional vasculature. This enabling technology is being commercialized by CU Aerospace and has been expanded from high strength fibers to include filament for fused deposition printers and 3D sacrificial templates. CUA is currently examining several applications for microvascular composites such as thermal management, self-healing, re-configurable antenna, but the possibilities are endless. For example, read about recent work on self-healing microvascular composites by UIUC researchers. Fabrication entails incorporating VascTech polymers into an epoxy matrix and curing at elevated temperature. After curing, the composite is trimmed to expose the sacrificial polymer, which is subsequently vaporized by heating the sample to ~200°C under vacuum yielding empty channels and a vascular network. By circulating fluids with unique physical properties, there is the capability to create a new generation of biphasic composite materials in which the solid phase provides strength and form while the fluid phase provides interchangeable functionality. View this video for more details. CU Aerospace (CUA) is an integrated aerospace company that is engaged in the research and development of promising new technologies and products. We have over 16 years of operating experience with core areas of expertise in spacecraft propulsion/software, high energy lasers, modeling and simulation, and advanced materials. CUA is located in downtown Champaign, just minutes from the University of Illinois at Urbana-Champaign (UIUC), which provides an environment where technology-based businesses can collaborate with one another and the UIUC. In addition, our close association with the University gives us access to state-of-the-art labs, equipment, and services.